This morning, a 5.6-magnitude earthquake struck the Los Angeles region. The City of Los Angeles has activated our Emergency Operations Center and is monitoring the situation. There are currently no reports of major damage to the city's water and power system, port, and airport. Residents who want to report damage or services outtages can call 3-1-1 to report items such as non-working street signals. Families are also encouraged to review the Los Angeles Fire Department's Emergency Preparedness Handbook. The Hollyhock House is one step closer to being restored, thanks to $1.935 million in state funding that has been officially approved by the California Cultural and Historical Endowment (CCHE). 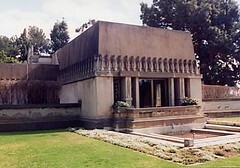 The Hollyhock House, located atop Barnsdall Art Park, is a National Historical Landmark designed in the 1920s by internationally-acclaimed architect Frank Lloyd Wright. It was seriously damaged in the 1994 earthquake and closed for repairs. The $1.935 million in new funding for the latest phase will be administered by Project Restore to transform the Hollyhock House into a museum-quality gallery and design space. 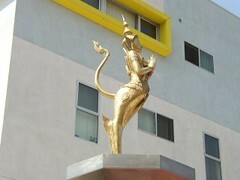 The restorations are expected to be completed by June 2012. These funds will help us give the Hollyhock House a proper restoration so that future generations can enjoy and admire its architecture, keeping our local heritage alive. Glassell Park residents can learn more about job opportunities, tutoring and family programs, and other resources at the “Summer Splash and Resource Fair.” The event is this Saturday, July 26, and starts at 11:00 a.m. It will take place a Juntos Park (1315 Drew Street). This free family event is part of our continued effort to help make the Drew-Estara neighborhood safer and bring more educational and economic opportunities to the families who live there. A police pursuit ended in tragedy last week when a drunk driver who was being pursued for reckless driving ran a red light and killed two pedestrians as they were crossing Hollywood Boulevard. The pedestrians, Pedro Davila and Cecilia Diaz, are survived by their three children who are Monserrat Arely Davila, 17, Diego Davila, 14, and Guadalupe Davila, 7. I have been working with Wells Fargo Bank, the Hollywood Business Improvement District, the Hollywood Chamber of Commerce, and Pedro Davila’s former employer of Combo’s Pizza, to set up a beneficiary account for those who want to provide financial assistance to the children. To contribute to the Davila children, visit your local Wells Fargo Bank and deposit funds to account number #7039283655. You can also mail checks made to “Monserrat Arely Davila” (include a reference to the account number) to the Hollywood Chamber of Commerce, 7018 Hollywood Boulevard, Hollywood, CA, 90028. The workshop is open to the public and will be offered in English, Spanish, and Korean. Please RSVP by Wednesday, July 30 by emailing my staff member Yolanda at Y.Flores@lacity.org or calling 213-473-7013. We hope to see you there! To provide renters with additional support during this foreclosure crisis, on Saturday July 19 from 10:00 a.m. -12:00 p.m., my office will be sponsoring a Housing Rights Workshop. It will cover the rights of renters living in foreclosed properties, among other housing issues, and representatives from the Los Angeles Housing Department and the City Attorney’s Office will be available to answer questions. The event will be held at Laguna Senior Apartments, located at 4201 W. Sunset Blvd. For more information, contact Yolanda Ramos at (323) 957-4500. This morning, I spoke to student honorees and donors at the Camino Nuevo Charter High School scholarship luncheon. At the event, 23 high school students were honored for their exceptional academic performance, and collectively received over $40,000 in scholarships to attend college. Camino Nuevo High School is a public charter school located in a low-income Los Angeles neighborhood, and was founded in 2000 to combat academic underperformance. Camino Nuevo students are held to very high standards. The school has the highest rank on the State Academic Performance Index (API) when compared to schools with similar demographics, and it is one of the top 10 performing high schools in the Los Angeles Unified School District. 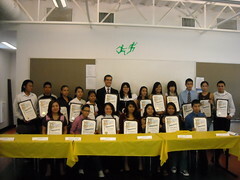 Congratulations to the Camino Nuevo student scholars on your achievements. We’re all looking forward to great things from them in the future! Last week, in a small ceremony, Thai Town and a few other communities were designated Preserve America Communities. First Lady Laura Bush, who announced the designations, is Honorary Chair of the Preserve America initiative, designed to support local efforts to preserve and celebrate our country’s cultural heritage. Communities designated as a Preserve America Community become eligible to apply for Preserve America grants and awards. On Saturday August 16th, from 10:00 A.M.-12:00 PM, the City of Los Angeles in partnership with Work Source California and the Los Angeles Community Development Department will be sponsoring “Making Business EZ in Hollywood”, a Business Resource Seminar. The seminar will focus on ways to lower operating costs and increase access to capital. The seminar discussion will also cover California business tax credits and incentives, business assistance programs, and ways to grow and find qualified workers. Attendees will also have the chance to meet with the City’s experts on business development. Please RSVP if you plan to attend. Yesterday, I joined Mayor Villaraigosa to celebrate the one-year countdown to the grand opening of Madame Tussauds museum. The Hollywood branch of the famed museum will feature many of Hollywood’s hottest stars and local notables, such as Beyonce Knowles, Jamie Foxx, and Hollywood’s honorary mayor Johnny Grant. Hollywood’s soon-to-open attraction will become another part of the neighborhood’s exciting renaissance and will draw numerous locals and tourists alike. I joined community members in celebrating the grand opening of the Witmer Heights Apartments, a 49-unit complex for low-income families in the Pico-Union neighborhood. In addition to the one-, two-, and three-bedroom apartments, the complex also features two community rooms, a rooftop terrace, laundry facilities, a computer center, and a tot lot. The Witmer Heights Apartments are a wonderful addition to this community and are providing quality, affordable housing to Los Angeles families. 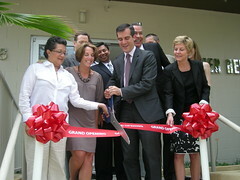 I’m proud that the City of Los Angeles' Affordable Housing Trust Fund helped make this project possible. Two schools and a soon-to-be-opened park are just a short distance from the new complex giving tenants the opportunity to walk to these destinations. Tenants will also have access to free classes on job skills, computer literacy, personal finance, health, nutrition, and more. 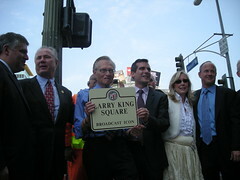 Intersection named "Larry King Square"
In honor of his 50th anniversary in broadcast journalism, I joined Larry King to announce the naming of the intersection of Sunset and Cahuenga Boulevards as “Larry King Square.” The Square is located at the CNN Los Angeles bureau, where King hosted Larry King Live 23 years. While most know Larry King for his work in radio and television news broadcasting, his influence in the community has reached far beyond that. The Los Angeles resident has established the Larry King Cardiac Foundation, helped organize relief efforts for Hurricane Katrina, and created a scholarship fund for aspiring journalists from disadvantaged backgrounds. King’s recognition for journalism include two Peabody Awards for broadcasting, and he was inducted into both the Radio Hall of Fame and the Broadcaster’s Hall of Fame. 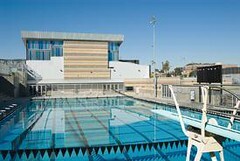 The Olympic-size pool at the Miguel Contreras Learning Complex on 3rd and Bixel Street is open to the public for the summer months. Swimming lessons are also available between 12:30 P.M. and 3:30 P.M. It is one of 14 pools at schools that the City is helping to keep open while school is out for the summer. City of Los Angeles pools are also open to help Angelenos cool off this summer. For hours and locations, visit The Department of Recreation and Parks website. In the midst of this foreclosure crisis, we are doing everything we can to keep Los Angeles residents in their homes – including renters who have paid their rent on time and are good tenants. They are truly innocent victims in this mess. Today we sent a loud and clear message to lenders and their agents: Los Angeles has laws designed to protect tenants’ rights and we are going to enforce them. Along with Councilmember Bernard Parks and City Attorney Rocky Delgadillo, I visited the home of Cynthia Spears and Armenta Mallory (who are pictured here with Cynthia's mother Dolores). Cynthia and Armenta live in an apartment that was foreclosed by Countrywide Bank. Recently, they received letters from an agent of Countrywide telling them to vacate their apartments by August 1 and offering them $1,000 in relocation assistance. It might sound good, but city laws prevent tenants from being evicted simply because a property's ownership changes hands. Also, if a landlord does decide to pursue a "no fault" eviction, the minimum relocation fee is $6,810. Cynthia sought assistance from the City of Los Angeles, and today, we announced that the Countrywide agent that handled Spears's and Mallory's apartment building has agreed to rescind their notice. The women and their families will be able to stay in their apartments. Renters who might be in similar situations are encouraged to get help as soon as possible by calling 3-1-1 and asking to be connected to the city's Housing Department. 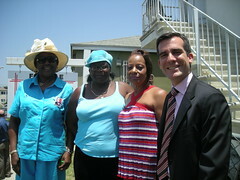 More information is also available on the Los Angeles Housing Department website. The Los Angeles Department of Water and Power is offering a $5 credit incentive for customers to enroll for electronic bill payment. Electronic bill payment provides customers an easy way to pay bills on-line, check their water and energy usage, and access environmental information. Paying bills electronically is also helpful to the environment because it reduces paper and printing associated with bills. To register on the website, customers need their Customer Access Number (CAN) from their bill, the last four digits of their Social Security Number or Tax ID, and their e-mail address. To enroll for online or phone payments, customers will also need their bank account information. The $5 credit will be provided once on each residential or commercial account upon enrollment. This program is free of charge for customers who have an automatic payment plan through their checking account. There is still a premium charge for those who pay by debit or credit card. To register on-line, customers should log on the LADWP website. For additional information or to pay by phone, customers may also call 1-800-DIAL-DWP. (1-800-342-5397). Everyone enjoys fireworks as part of their 4th of July experience. However, every year there are many reported injuries due to improper or illegal use of fireworks. To learn more about firework safety watch this informational video provided by the LAFD Historical Society for tips on how to have a fun and safe weekend.